Funny, irresistible and heart-warming, Love Actually is set in contemporary London in the weeks before Christmas and tells one story which weaves together a spectacular amount of love stories – sometimes romantic, sometimes sad, sometimes stupid – all funny in their own way. 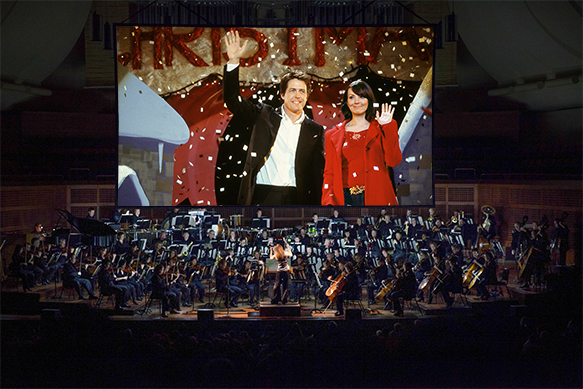 With the film becoming a Christmas tradition for many, audiences attending the Love Actually Live Concert Tour will be invited to to a unique way to watch the film: a full, live orchestra will perform Craig Armstrong’s evocative score at these shows, with the film being projected onto the big screen. Everywhere you look it seems love is causing chaos. From the new bachelor Prime Minister who falls in love 30 seconds after entering Downing Street to a loser sandwich delivery guy who doesn’t have a hope with the girls in the UK so heads for Wisconsin; from a jilted writer who escapes the south of France to nurse his broken heart to an aging rock star trying to make a comeback at any price; from a bride having problems with her husband’s best man to a married woman having trouble with her husband; from a schoolboy with a crush on the prettiest girl in the school to his architect step-father with a crush on Claudia Schiffer.